Aloo jeera recipe is one of the most popular, simplest and tasty recipes in India. It is a beginners' recipe. can be prepared very quickly. Potatoes and coriander leaves are the only vegetables used in this aloo jeera recipe. It can also be prepared during fasting. For that purpose replace normal salt with sendha namak. You can also avoid adding the spices that should not be consumed during fasting. So, for all the busy bees this recipe is the saviour. 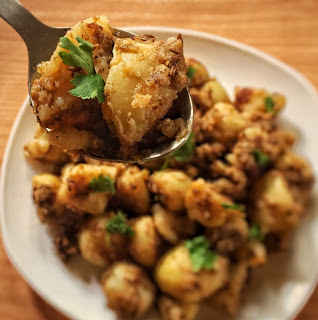 Here goes the jhatpat aloo jeera recipe! Pressure cook potatoes. For this, you should add enough water to cover the potatoes completely. You can also add salt while boiling. This is optional at this stage. Let it cook on high flame first. After the first whistle let it to cook on sim for another 3-4 minutes. Turn off the stove and let the pressure release on its own. Once it is boiled you can peel it and dice it. Heat oil in a pan. You can use any cooking oil. Add cumin seeds. Let it splutter. Add salt and all the spices (Aamchur powder, Coriander powder, jeera powder, red chilli powder and garam masala). 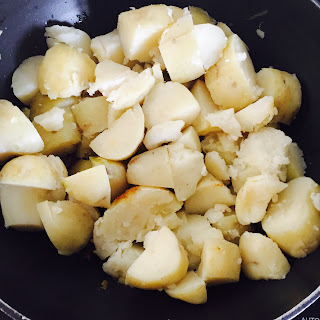 Add boiled and diced potatoes. Mix everything well and let it cook for another 2-3 minutes on low-medium flame. Aloo jeera is ready! Garnish it with coriander leaves and serve it with hot dal chawal or roti or parantha or even pooris! 1. Pressure cook potatoes. Once done, you can peel it off and dice it. Keep it aside. 3. Add cumin seeds. Let it splutter. 4. Add salt and all the spices ( Aamchur powder, Coriander powder, jeera powder, red chilli powder and garam masala). 5. Add boiled and diced potatoes. 6. Mix everything well and let it cook for another 2-3 minutes on low-medium flame. 7. Aloo jeera is ready! Garnish it with coriander leaves and serve it with hot dal chawal or roti or parantha or even pooris! Great vegetarian recipes is a food blog. Learn easy, tasty and healthy homemade food recipes here.